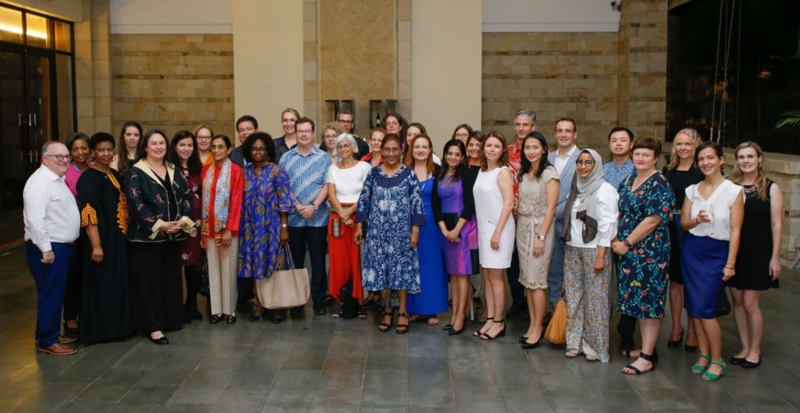 From October 14-16, 2018, on the first anniversary of the launch of the Women Entrepreneurs Finance Initiative, the We-Fi Governing Committee met in Bali, Republic of Indonesia, in the margins of the IMF/World Bank Annual Meeting. The Governing Committee, Implementing Partners, and Observers were welcomed to Bali by Indonesian Minister of Marine Affairs and Fisheries and We-Fi Leadership Champion Susi Pudjiastuti. Minister Pudjiastuti spoke of the transportation challenges she overcame in building her highly successful fishing business, which led to the founding of her airline, Susi Air. Meeting participants were inspired by Jakarta entrepreneur Cindy Mulyasasmita, a young woman with no technical background who invested her life savings in establishing an online dress rental business, TheDresscodes.com, which now employs 15 staff. Elizabeth Vazquez, President, CEO, and Co-Founder of WEConnect International, described how less than one percent of large corporate and government spend worldwide goes to women-owned businesses, and the power of We-Fi’s holistic approach in boosting women entrepreneurs’ access to procurement markets. After wrapping up its meeting, the Governing Committee was pleased to announce its Second Call for Proposals on October 17, 2019. Information on the Second Call including funding principles, eligibility, and the application process, is posted on the Funding page.